My adult son has tailor's bunions, as well as terrible corns on both pinky toes. He tries every product he sees, hoping for some relief. This is the first thing he has tried that allows him to be on his feet all day with less pain. Thank you for access to this great product. I love this product! Every Spring and Summer I have to break in the sensitive area between my big toe and the 2nd toe when I wear my thong sandals. When I bought this I thought to wrap a bit around the thong and then wore the sandals that way for awhile until my toes were comfortable. What a relief to be able to break them in without pain and blisters! Also, I used the wool to protect my baby toe that always gets sore in a pair of tight shoes I have and it worked great for that. I love this stuff! I bought a pair of heels that stretched out a bit and didn't stay on my feet like I wanted them to. I thought, wool toe pads like I used to have in my ballet shoes would fix the problem. 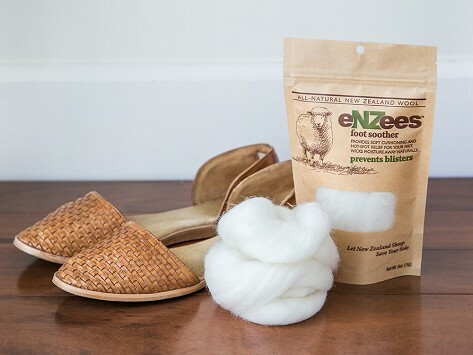 So I ordered this product, poked some of the wool down in the toes of the heels and they are now soooo comfortable! Bought for my husband. He said it works great! Aren't the natural healers the best? This works for my aged swelling toes as well as my granddaughter's new "too cute" shoes! I love to hike and I love my hiking boots, but there is a toe on each foot that rubs. Enzees SOLVED my problem. I made a removable, reusable ring shape out of the wool. Slide these Enzee rings on underneath my socks. Perfect solution! Thank you! A VERY happy customer. HIGHLY recommend. Love it. Reminds me of way back when I was a toe dancer. Use to use this in my rubber cups in my toe shoes. Had to buy it. Works great !